Chladni Patterns are the result of techniques of visualizing the vibrations of a resonating two-dimensional object’s sound. 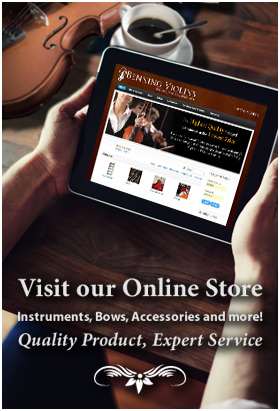 The techniques have proven useful to violinmakers in crafting the perfect sounding violin. The patterns illustrate different modes of vibration on violin plates. 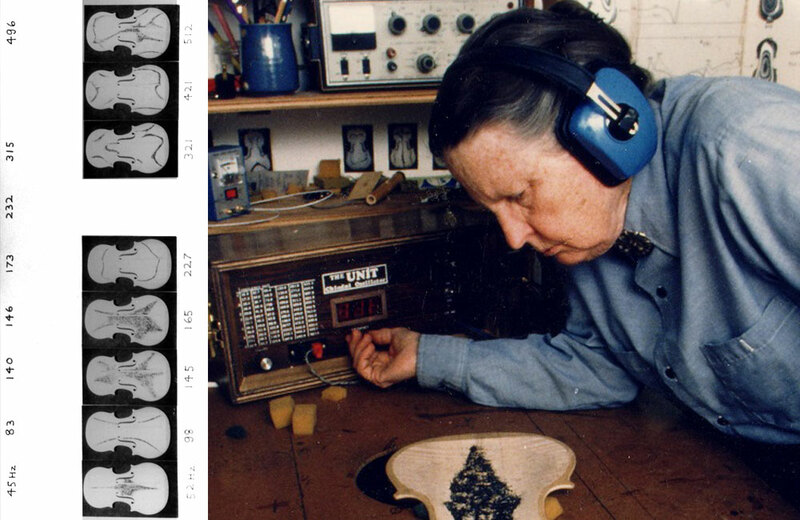 This and other scientific methods of examining the acoustic properties of the violin have become a key part of the violinmaking craft. Ernst Chladni discovered patterns that would form when he bowed the side of a metal plate while sand or sawdust was placed on top of the plate. The sand would move to “nodes,” the places on the plate that did not vibrate, while the places between the nodes would move up and down. As Chladni adjusted the pitch of the vibrations, he found that different patterns formed at different frequencies. Lower frequencies cause simpler patterns of two intersecting perpendicular lines, whereas higher pitches form more complex wavy grid-like patterns. Specific frequencies where the patterns change are called modes. Much like the one-dimensional vibrations of a violin string appear as waves, the two-dimensional vibration of a plate forms Chladni Patterns. The patterns can be induced with a bow or by using an electrical current. The shape of the plate as well as its thickness will inform the shapes of the nodes. Chladni’s discovery has become one of many useful techniques to perfecting the sound and craft of the violin. When using the Chladni technique, a symmetrical violin plate will form symmetrical Chladni Patterns. The violinmaker can then use the patterns as a guide for adjusting the symmetry of the plate and finding acoustical balance, essentially tuning the resonances of the instrument. Adjustments are then made to the shape of the violin plate or to the thickness by scraping the surface of the violin plate.